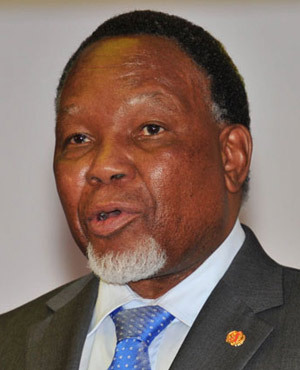 Johannesburg - Parastatals are being used to loot taxpayers’ money, former president Kgalema Motlanthe said on Thursday. Recent shenanigans at Eskom demonstrated that public resources are being wasted and people are being left in the cold, he said at Oxfam's launch of its South African branch at Constitution Hill. "Instead, people want to be praised for keeping the lights on, which is their only responsibility." He encouraged South Africans to exert pressure on the government over the running of state-owned enterprises. "We have a right to ensure that it’s not a place where you just send people who spend half the day on golf courses. We should ensure that young people are absorbed into these parastatals, so that they can hone their skills. There must be public accountability," he said. Brian Molefe’s reappointment as Eskom CEO was announced on Monday last week, after Public Enterprises Minister Lynne Brown blocked the board’s decision to give him a R30m pension payout. He announced his resignation in November last year, after being linked to the Gupta family in former Public Protector Thuli Madonsela’s State of Capture report. He returned to Eskom after a short stint as an ANC MP. Motlanthe painted a bleak picture of the political state of the country. "State resources are being used for personal gain, and personal networks are having devastating consequences for our economy. In these times, it is the most downtrodden within our democracy who feel the most acute effects of such deplorable acts." People could no longer be fed the slogans and jargon that had come to characterise public discourse. Leaders who had helped liberate the country are sinking into the pitfalls of power, and are both actively and passively participating in the continued debasement of the oppressed. "Our jubilant arrival at the doors of democracy has now been replaced by a realisation that our transition remains inchoate. Divisions among us repeatedly threaten the social cohesion of our country. Worst has been the present political crisis, which is characterised by an absence of ethical, moral and just leadership." Although the ANC had cautioned against its leaders publicly criticising the organisation, Motlanthe said he could not stay silent about the current political situation. "Such candour cannot be silenced by those who view disagreement as ill-discipline, estrangement, or hostility. Divergence and discord are essential to ensure that we move the markers of progress forward, and do not become complacent or convinced of our infallibility as leaders." South Africans are going to bed at night, wondering what changes they would wake up to, he said. He was referring to President Jacob Zuma’s major Cabinet reshuffle on March 31. The problems facing the country’s democracy go to the heart of its governance and leadership and affects every aspect of South African life, Motlanthe said. Many government officials have forgotten that they remain accountable to the people who had put them there, and that they are responsible for delivering constitutionally-mandated services.